O my Father—O Father of mine? It is such comfort to live under Your loving control and dominion. Earlier this morning, while I was in the middle of a sentence, I spotted a big roach. It went under my bed! Panic! I loathe those varmints! I stopped writing. I lifted my mattress. I saw nothing. Went back to my writing. After a few minutes, the varmint showed up again! I grabbed a shoe, but! I missed. The varmint went into hiding again. Where is it now, my Father? 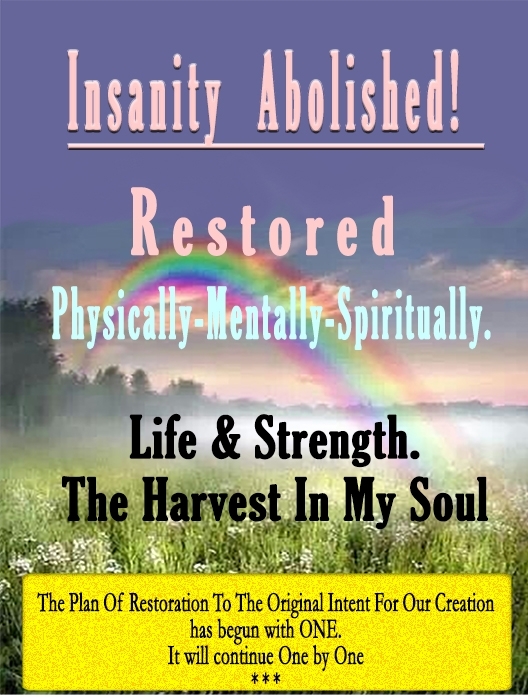 New title for thia-basilia.com: Insanity Abolished! Subtitle: Restored. Physically, Mentally, Spiritually. Head Line: The Plan Of Restoration To The Original Intent For Our Creation has begun in ONE. It shall continue One by One. Hello everybody! This is the most appropriate day to post a summary of my health restoration. Yeah, I talk about myself primarily, why? Because I am the product the Almighty Creator of our beings is offering to you all! How ‘bout that? Health restoration? Mine took every bit of 32 long years. Some of you were not even born when the Almighty started the arduous task to restore my health. No kidding! I pay attention to the meaning of numbers and number combinations because the Scriptures are specific with the mention of numbers for everything written therein. So, the combine number of 32 is, 3+2=5. The Number Five – Grace and Preparation. Now, this year I am walking on my 78th birthday. The combine number of 78 is, 7+8=15=3×5. That means 78 is Grace and Preparation multiplied 3 times! Wow! But! The Number Seven, Completeness and Rest. The Number Eight – Newness and Cycles. Alright, let’s keep that in mind for this summary. Because that is the sequence of events in the process to restore my health physically, mentally, and spiritually. In retrospect, I see now how the physical, the mental, and the spiritual were not restored separately. Rather it was a progressive series of events that took place for my complete restoration. These series of events were precisely scheduled by the Master Mind Who created me. Dear Reader, relax. I will now abide by the rules of human attraction and attention span. I will only give you a lil at the time. Well, O my Father, You know what I been doing. Been working on the cover graphic for my new title and subtitle. I think I got it now. I am ready to publish what I got so far. But I am open to any changes You quicken to me. Also, I wait on You as I go along on where to publish. Your leading is so accurate. It leaves me dumbfound! You are an awesome Yah! Bible, Christian, Father/Creator, love, poetry, Pondering, Real Life, Tragic Fact, true life, True Story, Truth, truth that set you free, unique posts I talk about myself primarily, why? Because I am the product the Almighty Creator of our beings is offering to you all! You have a big heart. You will be guided on where to publish your work.